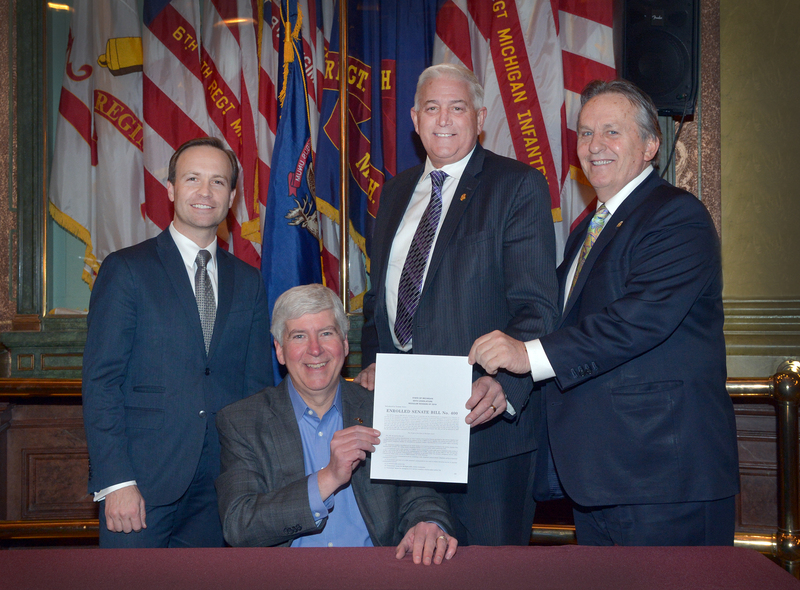 LANSING, Mich. — State Sen. Ken Horn joined Gov. Rick Snyder, Lt. Gov. Brian Calley and Senate Energy and Technology Chairman Mike Nofs on Tuesday as Snyder signed legislation that would make updates to the state’s 911 system. Senate Bill 400 provides a range of upgrades to the tools dispatchers currently use. Upgrades include the ability to send pictures and videos to 911 dispatchers as well as utilizing more accurate GPS location tools, giving dispatchers and officers a better idea of a distressed caller’s location. Photo caption: State Sen. Ken Horn, R-Frankenmuth, stands with Gov. Rick Snyder, Lt. Gov. Brian Calley and Sen. Mike Nofs, R-Battle Creek, as SB 400 is signed into law.